When a product, medication, or medical device causes harm to a large group of people, the law permits the injury victims to come together to bring a lawsuit against the person or entity responsible for their injuries. These types of cases are called “class actions” because the “class” of injury victims is made up of many victims rather than just a single person. By pooling their resources and legal counsel, these injury victims are able to bring a lawsuit that might otherwise be too large for the courts to manage. Most class action lawsuits involve a personal injury lawyer to help handle these cases and lawsuits. Read more about how a personal injury attorney can help organize class action lawsuits. 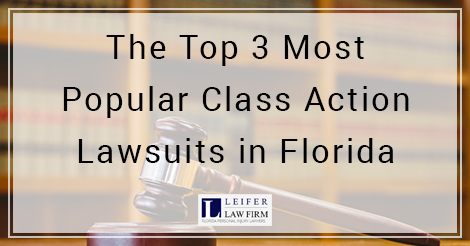 Read on to learn more about the top three class action cases that have grabbed the attention of the media and the public in a BIG way. If you or a loved one has taken the anticoagulant, Xarelto, it is critical to know about pending litigation related to this prescription drug. Given to people at risk of developing blood clots or experiencing a stroke, Xarelto is a blood thinner that has been known to cause possibly fatal bleeding and serious health problems. Manufactured by Bayer and distributed by Janssen Pharmaceuticals, a subsidiary of Johnson & Johnson, Xarelto has been heavily marketed as a better alternative to other types of blood thinners, such as Coumadin (warfarin). Approved for the market in 2011, Xarelto quickly turned big profits, netting almost $2 billion in 2013 with the endorsement of several major celebrities. Unlike other classes of anticoagulants, Xarelto has no antidote. In a patient who develops uncontrollable bleeding caused by Xarelto, medical professionals have no medication to stop it. Patients and their families have brought lawsuits claiming injuries and deaths caused by Xarelto. These lawsuits allege the drug company decided against fully informing patients and their loved ones of the risks associated with Xarelto. Some plaintiffs say Janssen and Johnson & Johnson kept marketing Xarelto despite a 2013 warning letter from the Food and Drug Administration (FDA) ordering the drug’s manufacturers to fix misleading claims and minimization of risk information. Read more about this class action lawsuit here. Patients have also suffered a life-threatening side effect called sprue-like enteropathy, which mimics celiac disease. In 2013, the Food and Drug Administration (FDA) ordered Daiichi Sankyo to modify its labels to warn patients about intestinal problems associated with Benicar. In 2012, Mayo Clinic researchers released a study confirming a link between Benicar and gastrointestinal problems. In the study, 22 patients taking Benicar over a three-year period all presented with symptoms suggestive of celiac disease, however, their blood test results showed they did not have the disease. The patients’ symptoms varied from chronic diarrhea and weight loss to mucosal inflammation and villous atrophy. The symptoms resolved and even disappeared completely when the patients stopped Benicar. Check out this site to learn more about this here. When an individual is at risk of developing a blood clot that can lead to a heart attack or stroke, doctors sometimes use inferior vena cava filters, or IVC filters, to capture clots before they reach the lungs. With an IVC filter, the overall aim is to force the clot to dissolve or break down before it can do any damage. Although IVC filters are typically very effective devices, there have unfortunately been cases in which defective IVC filters caused serious injuries and even death. A 2014 Safety Communication published by the Food and Drug Administration (FDA) highlighted many of the risks associated with IVC filters. A medical device safety communication published by the FDA in 2010 noted the FDA received nearly 1,000 adverse event reports related to IVC filters between 2005 and 2010. In many cases, defective medical devices are to blame for problems associated with IVC filters. Patients have brought lawsuits against several medical device manufacturers, including Johnson & Johnson, Rex Medical, C.R. Bard, Cook Medical, Braun Medical, and ALN Medical. Patients have also filed claims against doctors who knew of the risks associated with IVC filters and failed to warn patients of the dangers. In late 2015, NBC News reported one prominent IVC filter manufacturer, C.R. Bard, replaced a problematic IVC filter device with a new version even though it knew the replacement also had defects. Instead of recalling the redesigned device, the company kept it on the market for five years. At least 12 deaths have been linked to the defective IVC filter, which was marketed as the G2 series IVC filter. Many patients who had the G2 series implanted later discovered it had moved. Others found the legs had broken off the IVC filter inside the body. According to one doctor, he and his surgical team witnessed the legs of one filter break off the IVC filter and float near the lungs during surgery to remove the device. Read more about IVC Filter injuries and working with an IVC Filter injury lawyer here. If you have experienced health problems after taking a medication or using a product, it is critical to speak to an attorney who handles class action lawsuits in Florida.